Relatives and friends showed up at the Whim Magistrates Court to face the men accused of cold bloodedly murdering Danian Jagdeo, a phone card vendor and father of four, on February 4, last. 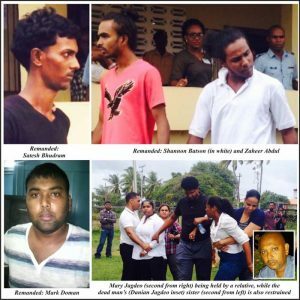 The accused, Mark Doman aka “Mikey”, 22, of 190 Nigg Settlement; Shannon Batson, 24, a father of one of Hampshire, Topoo Village; Abdul Salam Azimullah aka “Sato”,34, of 183 Hampshire Village; Zaheer Abdul aka “Marlon”, 28, of New Scheme Adelphi, East Canje, Berbice and Satesh Bhudramaka “Baba”, 19, a painter employed with his father, of 70 C Hampshire Village, Corentyne, Berbice, all appeared before Magistrate Charlyn Artiga to answer to the charge of murder of Jagdeo, during the course of a robbery. Mark Doman was represented by Attorney Chandra Sohan who stood in for Attorney Mursaline Bacchus. Satesh Budhram was also represented by Sohan. However, both men, who were appearing in court for the first time, lodged a complaint with the guidance of their lawyer that they were allegedly beaten by ranks. Budhram stated that he was picked up and taken to the Albion Estate road where he was reportedly beaten, while Doman told the court that he was beaten at the Whim Police Station. Abdul Salam Azimullah, who was represented by Attorneys Tonya Clemence Warren and Kim Kyte (Kyte was absent) also lodged a complaint that he was brutalised by ranks at the Albion and Whim Police Stations. Zaheer Abdul who was unrepresented also related to the court that he was picked up by police and taken to a dam at Tain Village and was allegedly given a sound thrashing as well. He reportedly sustained injuries and was allegedly denied medical attention. However, Magistrate Artiga endorsed the warrant to receive medical attention. Batson who was also unrepresented alleged that he was picked up and taken to the Rose Hall Outpost and the Whim Police Station where he was beaten by the Police and received injuries to his chin and ribs, he accused the police of firing three gunshots near his head. The complaints were noted by the Magistrate. Prosecutor Phillip Sheriff told the court that a statement is still outstanding, while both Attorneys requested to make applications for statements to be disclosed. The men who stood in the prisoners’ dock with a look of defiance were all remanded to prison until March 6. She was directing her comments to one of the accused who would normally frequent Jagdeo’s home as a friend of his. The dead man’s sister angrily yelled to the men “all y’all are pigs, it’s not gonna go down just like that…justice for my brother will be served”. Danian Jagdeo’s life was cut short during a robbery committed on him by an armed bandit at Adventure Village, Corentyne, Berbice. He was shot three times and was robbed of phone cards and cash. The gunman and an accomplice rode off on a motorcycle with the loot, while Jagdeo lay lifeless on the floor of the shop he was in. The men reportedly abandoned their motorcycle and were picked up by a car bearing licence plate number PVV 9465 with the slang “Thug Passion” on the windscreen of the vehicle. Due to diligent work by the ranks in ‘B’ Division, the suspects were all arrested.